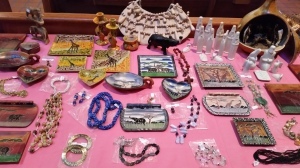 During our annual African Team Ministries sale, peruse and purchase crafts, jewelry and soapstone made by women in East Africa. This outreach program provides funding for orphan and refugee relief missions, clergy and lay education, clothing and books for students and evangelism in East Africa. They are also focusing on providing family-sized drip irrigation systems which provide a controlled release of water for maize ( a staple food) using only 5 buckets of water daily.